The number of graphics cards that can be connected to a single desktop PC depends on the number of adapter slots – PCI and PCI Express slots – that graphics cards can be installed in. If the graphics cards require auxiliary power connections from the power supply unit, the availability of those power connections will limit how many graphics cards can be installed. The highest-end graphics cards currently available can support three monitors each that show an independent (different) display. Theoretically, an infinite number of monitors that are displaying the same display can be connected using distribution amplifier boxes to send the signal from the computer to each monitor. 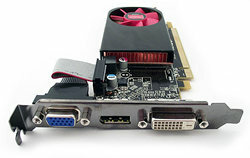 High-end PCI Express video/graphics cards also have to be connected directly to the power supply unit (PSU). The image below shows where the two 6-pin PCI Express (PCI-E) power connectors from the power supply are connected on an AMD Radeon HD 6790 graphics card. Note that all AMD’s and Nvidia’s high-end graphics cards are now double-slot cards that are twice as thick as a single-slot card, which means that although installed in only one slot, they require the space of two PCI Express slots. Also note that if you have a small case, you should measure the space available to a particular graphics card before buying it. The specifications of all graphics cards, including their length and height, are provided from the manufacturer’s website. If a card’s length or height exceeds the available space, it cannot be installed. Low-profile cards, designed for small cases, have half the height of standard-sized cards. Also note that all the most powerful high-end graphics cards require one or more 6-pin or 8-pin PCI Express power connectors provided by the power supply unit as an auxiliary source of power. Standard Molex power connectors on a power supply unit (PSU) can be adapted to the 6-pin and 8-pin power connectors by using an adapter cable costing around £3 or less. You can now buy and adapter that uses two Molex connectors to produce a single 8-pin PCI Express power adapter. Web-search: “Dual Molex LP4 4 pin to 8 pin PCI-E Express Converter Adapter Power Cable” – only 99p on Amazon in the UK. The following website shows examples of PCI Express power connectors. If a particular power supply unit doesn’t have the required number of PCI Express connectors, it’s possible to buy an adapter that is fitted to a standard Molex power connector that changes it into one. There are now four graphics-display standards in use – VGA, DVI, HDMI (high-definition) and DisplayPort. DisplayPort comes in a standard version and as the Mini DisplayPort version, which can be converted to standard DisplayPort with an adapter designed for that purpose. All of those standards are digital except VGA which is an analog standard. DVI-I output ports of the DVI standard can carry both analog VGA and digital DVI video, but DVI-D ports of the DVI standard can only carry digital video. The image shown below of a PCI Express AMD Radeon HD 6450 graphics card has digital DVI-D (right), DisplayPort (middle) and analog VGA (blue, left) output ports. A DVI-D output port can use a DVI-to-HDMI converter for 3D display over an HDMI 1.4a connection, which all new HD TVs provide. You’ll note that a DVI-D port shown below in the image of an AMD Radeon HD 6950 graphics card does not have the four extra analog VGA pins provided by a DVI-I port (shown in the image of the face plate of a graphics card with a white DVI-I port immediately below it) that can connect it to a monitor’s VGA input port via a supporting cable. The full-sized and Mini variation of DisplayPort is growing in popularity as a means of connecting high-resolution monitors to desktop and laptop PCs. An HDMI port on a graphics card, TV or monitor can also be connected to a DisplayPort on a graphics card, TV or monitor by making use of an all-in-one HDMI-to-DisplayPort cable. The digital HDMI standard carries sound and audio for modern PC monitors, TVs and home amplifiers. It can be converted to DVI with a suitable adapter cable, but with the loss of sound, which can be made good by connecting the device to the PC’s sound card with a suitable connection cable. In July 2011, the company responsible for governing the HDMI standard decreed that adapter cables for converting an HDMI port to a Mini DisplayPort are not covered under existing licences and therefore must not be sold. Fortunately, it is still legal to use a dongle that accepts an HDMI cable as an input which has a DisplayPort connector. This means that instead of using a single cable, two cables are required to achieve the same connection – an HDMI cable and the dongle. Heads obviously need smashing together over this silliness. If you want to connect an HDMI port to a DisplayPort with a single cable, you’ll have to buy one while they are still available.